Forbidden Planet NYC will be closed tomorrow, November 28th, in observance of Thanksgiving. We’ll re-open Friday at 9am with damn near EVERYTHING on sale! Forbidden Planet NYC is open today in observance of NEW COMIC BOOK DAY! If you’re traveling we’ve got plenty of great reading material to get you through the horrors of the NJ Transit or the long flight to Walla Walla. It’s that time of year again, a time to give thanks and be grateful. Or more importantly a time to buy a bunch of awesome stuff on the cheap. This black Friday at Forbidden Planet, everything (yes EVERTHING) is 20% OFF from 9a.m. to 9p.m. If you’re the person whose been waiting to read Cerbus, or pick up one of IDW’s beautiful artist editions book, or your home is desperately in need of a life size bust of Jango Fett (I can’t type this loud enough) NOW IS THE TIME! Don’t miss out on the chance to get the things you love for way less monies. Start off the holiday season right already having got everything you wanted on your list from the person you love most (that’s you). 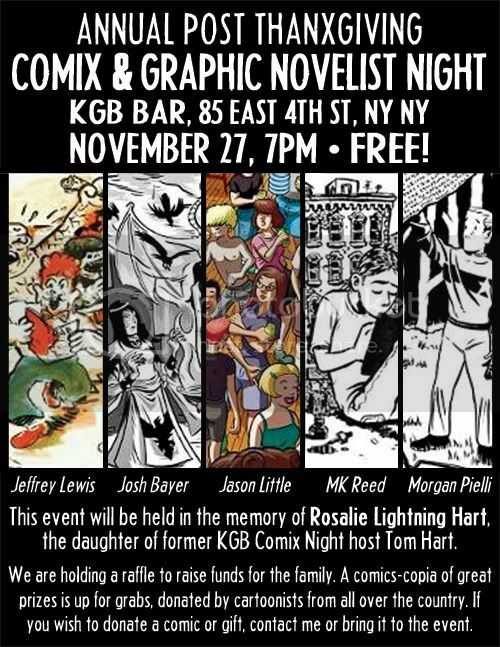 Annual Post Thanxgiving Comix and Graphic Novelist Night! Josh Bayer is a Cartoonist/Artist/illustrator living in Harlem, NY. He began publishing his comics in 1988. Since then, he has collaborated with Raymond Pettibon, been listed in Best American Comics, been rejected by The Yes Men’s Fake NY Times project. He is an advisor at the Sequential Art Workshop and a teacher in schools all over New York. Jason Little’s Jack’s Luck Runs Out was the first Xeric-funded comic book to be printed in color. His first graphic novel, Shutterbug Follies won two Ignatz awards. His second book continues the “Bee” series with Motel Art Improvement Service, Jason teaches cartooning at the School of Visual Arts and curated three exhibits of comics-as-installation-art at the Flux Factory. Morgan Pielli has self-published his short fiction series Indestructible Universe Quarterly since 2008. His work has appeared in numerous anthologies; including Sundays and Funny Aminals, and newspapers such as The Vermont Commons and Bash Comics Weekly. Morgan posts new Indestructible Universe comics every week online. MK Reed is the author of Americus, drawn by Jonathan Hill & released this fall by First Second, and draws the web comic, About a Bull. Americus first appeared as a short story in Papercutter #7 and was nominated for a 2008 Ignatz for “Outstanding Story”. Morgan Pielli has self-published his short fiction series Indestructible Universe Quarterly since 2008. His work has appeared in numerous anthologies; including Sundays and Funny Aminals, and newspapers such as The Vermont Commons and Bash Comics Weekly. For more information visit him online at http:// www.morganpielli.com/ and follow him on Twitter at @UltraMorgnus. We here at the Planet know what a grind traveling on Thanksgiving holiday weekend can be. My dad moved to Jersey in the 90s and I can personally attest to the many varied horrors of Penn Station and the NJT on the Wednesday before Turkey day. So here’r some reading suggestions of books releasing this week you may want to pick up for your various road trips to friends’ and/or families’ abodes. Hopefully these books will take your mind of grandpa’s snoring next to you in the car, bring you serenity even though the kid behind you is kicking your seat on the plane, guard you from the dude (or dudette) hovering over you on the train’s halitosis, or just generally getcha through a long holiday weekend. Chew V.1 TP Taster’s Choice- Tony Chu: Detective. With a twist. Tony gets psychic impressions from whatever he eats, making him one helluva bloodhound if he’s willing to ingest oh, say, corpses, crud off the floor, and all manner of unpleasantness. Pretty nifty concept from creators John Layman and Rob Guillory. Published by Image, this graphic novel should whet the appetite of any starved fans of Warren Ellis’ Fell. The book’s also got its tongue firmly in cheek and if you dug the television program Pushing Daisies or the grotesqueness of a Chuck Palahniuk short story you definitely want to give this a try. Plus- how apropos on a holiday based around gorging, chowing down, and general pigging out?! And it’s only ten bucks! The Winter Men TP – The Soviet Union has collapsed and as the subjects of an experiment to create superheroes deal with the fallout. Writer Brett Lewis and artist Jean Paul Leon paint a very bleak, very cold atmospheric gem. While not the flashiest books on the racks, believe me, it’s mondo terrific. Winter Men’s got cult masterpiece all over it. There ya have it. Cannibalistic detectives and ex-commie superheroes. Now you have something to talk about at the dinner table.